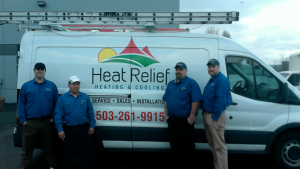 With more than 20 years of experience in the heating and cooling, Heat Relief is dedicated to providing total home comfort for Portland area residents. We serve those in Multnomah, Washington, Clackamas and Clark counties. Based in Portland, Heat Relief got its start in 1997. As the needs of their customers grew so did the services Heat Relief offered. Now Heat Relief offers a one-stop shop to their customers, who are able to take advantage of their various services, heating, cooling, and air quality systems. At Heat Relief, we believe that our quality workmanship, customer service, and comprehensive solutions make our business stand out. We look at every factor that can affect the comfort of your home and then we follow through with our maintenance and 24-hour emergency care to make sure you get the most out of your investment.